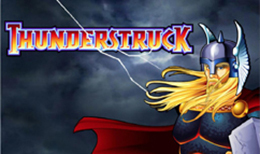 Thunderstruck is a 5 reel online slot game with 9 glorious pay lines. This game gives a nod to Thor and his hammer and rests heavily on the Nordic theme. Deposit today and bestows the power of Thor’s hammer when you spin your way through the reels and match up ram symbols while fighting your way onto the bonus card round where you can win greater rewards. We also recommend another online casino game that we have in our homepage. Microgaming is one of the oldest and most recognised suppliers of online casino software, and can truly be called a leading online gaming developer. In 1994, they launched the Gaming Club, claiming this to be the first online casino and still uses Microgaming software to date. With over 600 hit titles, this developer has continued to stay on top of the game in this very competitive industry. In addition to providing hit online casino games, full of the latest innovations, they are renowned for their honesty and integrity. Not only can you be sure that your personal data is safe, Microgaming also pays out jackpot wins immediately and in full. Step into the world of Norse mythology in its purest form and fight an epic battle on the plains of Valhalla. In this online slot game Thor appears not as the diluted comic-book form, but as the mighty god of storms, thunder and lightning. This ancient Viking god is waiting for you on the main screen, his golden beard and mane of hair waving in the stormy wind and his piercing blue eyes will entice you to play. Just one strike of his legendary hammer is all it takes for the gold to start pouring off the reels, any maybe his mighty powers will bring you luck as you play this 5 reel, 9 payline slot game. You can start your bet from 9p up to a maximum of £90 per spin, and you can set your coin value from 0.01 to 45. Decorating the reels on Thunderstruck are storm related symbols, you will find Thor himself, Rams, Thor’s Hammer, a Horn, Thor’s Fist, Lightning and a stormy Castle. You will also see the traditional playing card symbols which count as the lowest value symbols. Thor is the Wild symbol and he will substitute for all other symbols aside from the Scatter Rams helping you to create those winning combinations. In addition to that, your winnings will be doubled whenever you have Thor as a substituting symbol in a winning combination! You also have the Scatter Rams symbols which trigger the Free Spins feature. If you land 3 Rams anywhere on the reels you will trigger 15 Free Spins, and during this round your winnings will be tripled! Not only that, but you can retrigger a further 15 Free Spins in the Free Spins feature by landing another 3 Rams, giving you a further chance to triple your jackpot. There is also a Gamble Feature available after any winning spin. It is optional, so you can always opt out. If you decide to try your luck you will have to guess the colour of the card dealt to double your win, or you can guess the suit to quadruple your win. Guess incorrectly and you will forfeit your bet. Thunderstruck will appeal to anyone who enjoys a Viking inspired theme. Microgaming have done an excellent job on the graphics and you will feel as if you are battling alongside the legendary god himself. The betting range on this online slot game is low but it does come with a RTP of 96.1% which will entice all types of players to this outstanding online slot game. Want to try another Slot Game? Read more and play Thunderstruck.